We tasted dozens of single-varietal honeys to find the best of these six common varieties. Pale yellow in color with spicy aromas, fresh fruit flavors and a clean, minty finish. Bee Raw Honey, $12 for 11 oz; bee-raw.com. A mild, light-amber honey with delicate fruit flavors and a pleasantly spicy finish. Moon Shine Trading Co., $9.50 for 16 oz; moonshinetrading.com. Can range from pale to dark amber; incredibly aromatic with unmistakable anise notes. 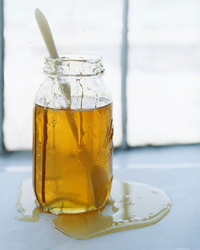 MtnHoney, $7 for 16 oz; mtnhoney.com. Amber-colored and mildly sweet with mint and toffee notes. Marshall’s Farm, $10 for 8 oz; marshallshoney.com. A bright yellow, sweet honey, with complex herbal and floral flavors and a greenish tinge. Smiley Apiaries, $8 for 16 oz; floridatupelohoney.com. Robust and deeply complex; looks and tastes like molasses, with malty, earthy flavors. Ames Farm, $13 for 18 oz; amesfarm.com. A sudden abandonment of beehives by the adult population. CCD affected roughly one-third of U.S. beehives last year. So far, no cause is known. Also called monofloral, this honey is predominantly made from the nectar of one species of flower grown in one place, yielding a distinct flavor and color. Honey that hasn’t been pasteurized, processed or filtered retains the pollen, enzymes and nutrients believed to provide health benefits. An age-old health practice that uses honey, pollen and other bee-derived products to alleviate allergies and promote well-being. For information, go to apitherapy.org. While scientists investigate Colony Collapse Disorder, here’s how bee and honey lovers can take action. DIY beekeeping is gaining popularity, even in big cities like New York. Go to abfnet.org for info on how to get started. Talk to local beekeepers and buy only from those who follow careful beekeeping protocols. Visit honeylocator.com. A garden with a variety of plants that flower throughout the growing season can feed bees year-round. Dandelions and other weeds are important food sources for bees, especially in the spring. Avoid using pesticides.